6.15 a.m. Matins and Lauds. The Conventual Sisters of St. Dominic rise in the early morning and gather in the Chapel where, after reciting the Prayer of St. Thomas Aquinas in praise of the Blessed Sacrament, "O Sacrum Convivium", they sing the Hours of Matins and Lauds of the Divine Office. Their charism, which combines both contemplation and active preaching, is reflected and symbolised in the graceful gestures which make up the traditional Dominican liturgical style. 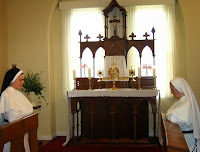 After the Office, which may take around three-quarters of an hour, there is a half-hour of silence for Mental Prayer, a privileged time of communion with God, which flows out of the Prayer of the Church and into the great high point of the day - the Mass. After Mass, the sisters take a simple breakfast in common. They listen in silence, as one of the sisters reads a short reflection on the day's liturgy or an excerpt from a Catholic book, paper, magazine or Church document. 8.25 a.m. Terce & Lectio Divina. After breakfast, Terce (Small Hour of the morning) is chanted in Choir, followed by a short period of Lectio Divina before the sisters begin their manual and apostolic work. Apostolic work, formation classes and/or study continue. 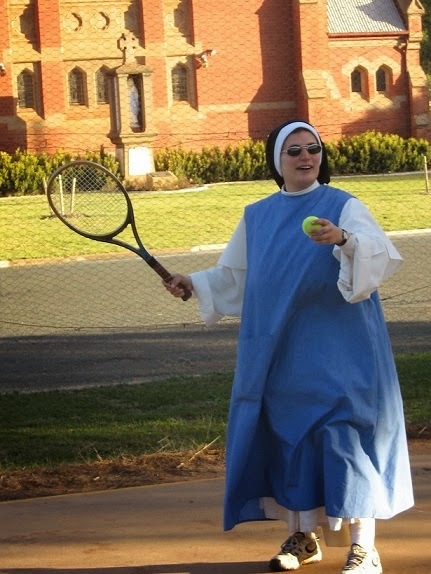 At present we serve the Church primarily through education at St Mary MacKillop Colleges, Wagga Wagga. Four mornings a week each sister teaches Religion and two other subjects from 9.30 - 12pm. This is taken, either in silence, listening to chant or a talk, or informally, with conversation. From 2-00pm the sisters are free to read, study, pray, rest or carry out community duties in kitchen or laundry when they are required. Sisters in formation may have classes/ lessons. 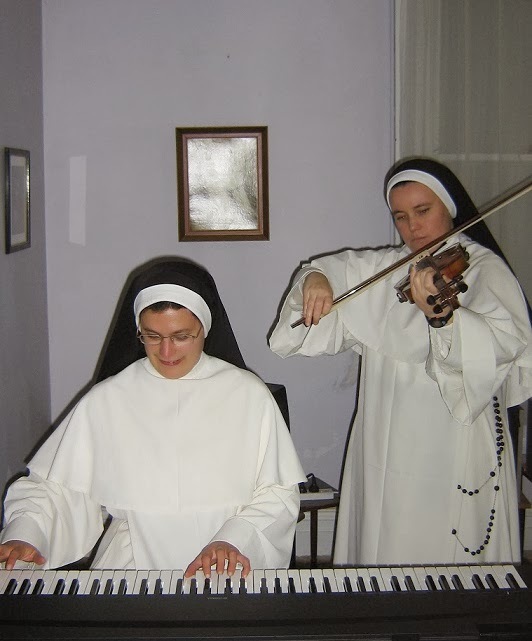 Silence is usually observed in the Convent to create the right atmosphere for the study and prayer which are so integral to our life. 5.00 p.m. Holy Hour with Vespers & Rosary. This Holy Hour, with Exposition of the Blessed Sacrament, includes silent prayer, the singing of Vespers and the silent recitation of the Rosary. The main meal, which has been prepared by one or another of the sisters, is preceded by Monastic Grace: a procession with prayers for the dead and ceremonial grace sung in Latin. The food is quite simple - a main course and fruit. Abstinence from meat is observed on Wednesdays and Fridays, and on Fridays there is a special fast with no main meal taken. During the meal we listen in silence to readings from the Gospel, from the Constitutions of the Community and to tapes and books on religious themes. After the meal the sisters recreate for an hour or so, walking, doing art or craft, or just enjoying conversation. Sharing stories and laughter, playing a game indoors or out - this time develops the family spirit so important to religious community life. The Night prayer of the Church's Office is especially loved and treasured by the Dominican Order. In this community the traditional Latin Compline of the Order is sung with its processions in honour of Our Lady and St. Dominic. After this final public prayer for the day, there is usually a short period of secret prayer in a darkened chapel, after which the sisters retire. 10.00 p.m. Profound Silence in the convent begins.